Here are the most frequent questions asked by our readers and customers about the course. If you can’t find an answer to your particular question, then please free to ask us using the comments section at the bottom of this page. We usually reply within 24 hours. 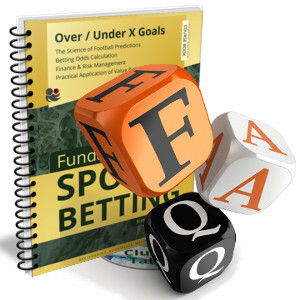 These FAQ’s refer to the: Fundamentals of Sports Betting: Betting on Over Under ‘X’ Goals course. What’s the point of calculating odds yourself? This is a very, very popular question and is answered in a dedicated article: Are Betting Odds Worthwhile Calculating? Are Betting Odds Always Fair? Am I correct in assuming that you don’t use the usual criteria that 98% of ‘hobby punters’ employ when forming their opinions? I mean the last 6 games, the H2H stats, team news, etc. Are your parameters different from the usual bog-standard criteria? Yes, absolutely. The gambling industry as a whole relies to a large extent on the ignorance of its customers. This course is designed to give the reader the essential, fundamental knowledge necessary to understand the bookmaker market. We teach descriptive statistics and the reader learns how to look at data sets, calculate own probabilities and odds, analyse the market odds on offer, and make informed decisions when predicting football results. Many false beliefs that the majority of gamblers and fans of football have about betting will be exposed and stripped away. If team news, injuries, suspensions, recent form, etc. would have any relevance to setting odds how would bookmakers, who publish their prices weeks in advance, stay in business? Will the course help identify value in-play? With respect to in-play value the course is very helpful as you can apply the knowledge of calculating probabilities to both the half-time and full-time goals market. Then you can choose, for example, matches with a high probability to score during the first half. These matches you can back, say Over 2.5 goals before kick-off, and lay them as soon as the first goal has been scored. We are going to address this in more detail in an article to follow. Can odds be calculated for Over 1.5 and Over 2.5 using this course? Yes, the odds for all Over and Under options can be calculated using this course including Total Goals. The course is about the German Bundesliga. Why not the EPL? Yes, we are fully aware that the majority of our readers are far more interested in the EPL than the Bundesliga, but the problem is that the average punter is very influenced by his/her opinion and ‘knowledge’ about their own supported league. It was therefore important to choose a more neutral league for the course, one where gut feelings and emotions are less strong. It had to be a league which is also well known, with plenty of bookmakers offering odds, and at the same time one where the majority of our English speaking audience is unlikely to connect emotionally. Thus, the Bundesliga it is! Are the principles and analytical techniques in this course transferable to other European football leagues? Absolutely! The principles and techniques are transferable to any football league worldwide. Is it correct to say that the course is exclusively for the Over/Under Goals market or are the skills learned from it transferable to other bet types, such as 1×2 betting or Asian Handicap? Yes, that is correct. Fundamentals of Sports Betting – Over/Under ‘X’ Goals is the first of a series of books educating the ‘Fundamentals of Sports Betting’. The course explains everything using European odds. Can I get the course with fractional odds? Sorry, but we don’t offer the course in any other odds format than European odds. The automated Excel file sounds particularly interesting. What exactly is automated? The tables in the Excel file are fully automated. Just select a team from the list in the ‘Betting Tables’ tab (cells B3 to E3) and every calculation in the workbook will update automatically to those of that team’s stats. How this works exactly and what the numbers mean is explained in greater detail in the course. Is the course only available as a PDF or can I get a printed version like the one shown on the advert? The PDF has been professionally optimised for double-sided printing. Just print your book in full-colour with a cover and add a binding of your choice. There is a heading “Value Betting using the Value Calculator”. Does that mean that I will receive the Value Calculator (VC) for free when I buy the course? You don’t need the Value Calculator to understand the course, therefore the VC is not supplied with the course. When we refer to the ‘Value Calculator’ we explain how it works and what the calculations mean in terms of Over/Under bets. Of course, the VC also contains a wide range of other bet types such as FT and HT 1×2, Correct Scores, HT/FT, and many more. The goal of the course is to enable the learner to create his/her own Excel application which works for him/her. Empowering learners to think for themselves is one of our ethics. Having worked through the course you should be able to build a Value Calculator yourself, if your Excel skills are good enough. If I purchase the course, what else do I get? 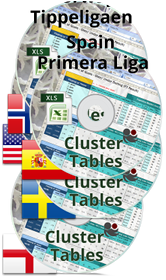 The course comes in an electronic format and the bundle includes the course book (PDF) and a Bundesliga cluster table (Excel), which the examples are based upon. In addition, you will receive for free the very latest Bundesliga table for the current season (valued at £27.50). Within the course you will find a discount code enabling you to download for free the German Bundesliga sheet in future seasons, meaning that you will always have access to the most current Bundesliga cluster table, forever: it doesn’t matter when you bought the course. Could you tell me where I can buy the Value Calculator if I can’t build one myself? How can I pay for the course? I have neither a PayPal account nor a credit card. I live in Hungary; if I understand you correctly, the purchase price is therefore £59.00 * 1.27 = £74.93. Is that right? The VAT rate applied to these products and services is based on the location of the customer. See the current EU VAT Rates. However, once you have paid you will get the product download link delivered immediately to your inbox. As long as you don’t download the course and cluster tables you have a cancellation period of 14 days and the right of a full return. Otherwise, once downloaded, there are no returns for digital content. I purchased your book but I have not received the download link for the item. I am having trouble at the beginning of the course. I don’t know how to calculate answers to some of the exercises. Although this is a beginner’s course aimed at people with little odds calculation knowledge and basic Excel skills, it may be quite hard for those who have always found maths quite a challenge at school. Just take your time, read each chapter several times, repeat the practice areas, solve all the exercises, try to understand everything. You will be rewarded with knowledge. To keep it simple, the course contains no shortcuts. All calculations need to be done manually. Once you master the course and understand everything you will certainly develop a method to make it easier for yourself. All formulas are given in the course either in the chapter of the exercise, or at the end of the book together with the solutions of the exercises. If you need help, you are welcome to ask specific questions here on this FAQ page. Regarding the historical odds you’ve used to calculate the Home/Away quotient – Are these the opening odds of the bookmakers or the odds after adjusting to market conditions? The course uses football-data.co.uk data. These odds are taken on Friday evenings before the weekend games, and on Monday evenings for the midweek games. Our approach is to have plenty of time to do all the calculations and make decisions, and totally remove the need to sit in front of the computer just before a game starts. There are loved ones to share time with and lots of other nice things to do than spend time in front of a computer on a Saturday or Sunday morning. Anyway, if you wish to use opening odds then you would have to adjust the tables accordingly. However, even if the clusters move slightly, there really shouldn’t be too much of a movement because odds don’t change so much that they significantly affect the HO/AO quotient. To play it safe, for fast moving odds you can always use two adjoining clusters when calculating odds. You describe in the course two different methods to find value bets. Is it true that there are only two options to calculate value? The Value Calculator method and the Cluster Table method? In reality, there are many more than just these two methods. However, these two are perfectly adequate, and they both work. There is nothing wrong with admiring complexity, but solutions should be sought in simplicity. The course provides “simple” answers. Can I e-mail you with any questions I might have about the course? Please always ask any questions via the comment functions at the bottom of any article in this blog. You will receive our answer submitted directly to your inbox, with no need for continuous checking. Or see our Contact Us page for more information. You can ask questions via the comment functions in any articles on this site. We normally reply within a few hours. The answer will be submitted to your inbox. We simply don’t have any ‘theories’. We educate the public about bookmaker maths – bookmakers certainly don’t grow their businesses based purely on ‘theories’. 2011-12 was a time when we were writing match previews for Betfair Germany based on our ‘theories’. Unfortunately for our growing band of followers Betfair withdrew from the German market in October 2012, and our match previews stopped. Why? Because we lost our client (Betfair) who paid us for match previews. Why didn’t we just simply continue publishing match previews on Soccerwidow? I keep asking myself if your ‘system’ works so well, why don’t you earn your own money with it instead of selling it? This is a question that probably interests many readers and it appears in the blog every now and then. Firstly, the course is not a ‘system’. It is a ‘simple’ maths book (at least for us). A little statistics, a little probability theory, a little about standard deviations, etc. This is what odds compilers do in their sleep when they calculate their odds. Secondly, there are enough people who teach financial analysis without ever trading professionally in shares. If every professionally trained person would trade, then there wouldn’t be any teachers. And if nobody wanted to teach, what then? Thirdly, a day has only 24 hours and we too sometimes have to sleep. We run two websites (Soccerwidow and Fussballwitwe). Running these blogs takes an enormous amount of time. Everybody has to make a decision what they want to do in life… We run websites, write courses and develop betting tools. When we have time, we occasionally place a bet or two, but that’s our personal business – betting itself is purely a hobby for us. In the betting business, in order to win, somebody must lose. Do you consider the moral side of betting, or is it just a numbers game? The intention of this blog is to educate people about gambling. Indeed, to teach them everything they need to know about gambling because our strong belief is that the more educated people are, the more informed decisions they will make. (2) they will reduce their betting habit or stop it altogether. There are many qualities required to be a successful bettor and unfortunately, not everyone has them or can/will ever attain them. If we can point you down either road then this is the achievement we are looking for. It’s our own way of fighting gambling addiction; we help people to better themselves and succeed, or to face facts and shed their habit to save money and free time for family and friends. Any updates on when the next course (1 x 2) will be published? I’m slowly getting through this course and looking forward to the next course. I’m sorry to disappoint but the 1×2 course will take another long while. The O/U course is currently undergoing a massive update (in German: my mother tongue) and the plan is to get the book finally printed and in the book shops. The problem I’m facing right now is that I simply cannot find a publisher because it’s a book about betting and betting in Germany is highly regulated. This means that we have to go down the self-publishing route, and without any experience in self-publishing, our workload increases immensely. When creating a portfolio for U/O betting what would be the highest relative standard deviation in % that would still be fine to use. Is 5% or higher Rel SD already too high or where do you personally draw the line. My second question is about profitability, how can I calculate it for a bet where i get 100% chance from cluster tables. In odds that is 1.00 so i can’t use the formula from the course. And I have the same problem for a bet with 0% chance,where i can’t convert that to odds. Any tips? I’m sorry but you will have to experiment yourself. Each league follows different rules and, for the Bundesliga for example, the Rel SD shouldn’t be much higher than 5%. If it’s out by much more then the bookmakers have factored in something that the cluster tables don’t cover, such as a massive performance change for a team, for example (e.g. this happened to Man Utd after Ferguson left; the anomaly in their performance lasted for a couple of years). To your second question.. if you have a probability of 100%, then convert it in 1.0001 odds to carry out your calculations; 0% chance 1,000. What adjustments/things to consider when applying the Fundamentals of Sport Betting Course (over/under) to Vodds? I notice that Vodds uses quarter bets e.g. 0.75, 1.25, 2.25 etc to the over/under market and I’m not really sure how to apply what I’ve learnt to these type of bets. For example, I can work out the value for an over 2.5 bet bit what if the odds offered are for an over 2.25 bet? How do I determine the probability for this? To be honest, I would recommend keeping your hands away from these bets, although it may sound tempting to get half of the stake back. Although these are referred to as being a single bet they are actually two completely different bets rolled into one! If you want to bet on both, then play them individually. Regarding calculating… you’ll have to calculate twice… one for the O/U .5 bet and the other for the total goals. Thank you for reply and yes i’m quite enjoying the course its really informative. Regarding the S and T columns i found them by looking at the formulas in the betting tables tab and if i understand correctly they are kinda cosmetic because you use HO/AO quotient for a specific match that you want to analyze. I guess i’m just curious how you got those average home and away odds number. As you have pointed out i can see now they are sorted but i don’t know where they are taken from. Hi Gasper, have a look at the formulas in column ‘S’. For example, cell S12 uses the formula =AVERAGE(J12:J21). This means that it calculates the average of the highest bookmaker odds in the cells J12 to J21. This calculation is needed to display in columns ‘D’ and ‘E’ in the Betting Tables tab the average odds corresponding to the odds clusters. I can see the numbers in the data tab match the ones you can get from football-data.co.uk, but the home average and away average odds in the S and T columns do not. Are those calculated or taken from somewhere else? The S and T columns in the Data Tab are helper columns to populate the D and E columns in the Betting Tables tab. If you look at the J column (home odds) and L column (away odds) in the Data tab, the odds there are not fully sorted in numerical order as the Data tab is sorted by the N column (HO/HO quotient). The S and T columns are there to get the average odds which correspond closest to the HA/AO quotients. In terms of best time to use the cluster tables to compare numbers against the available odds is it always best to perform the calculations the night before the games i.e using the odds where they end up. Or is it feasible to perform the calculations at anytime in the week preceeding a game? Just wondering how to make most effective use of the cluster tables. I’m thinking with wanting to look at multiple leagues, I will need to do the calculations over a number of days. Odds hardly change before the day of kick off. They start getting crazy once the team news are published what is often just a few hours before the match. Once the news are published the emotions of the punters start playing wild and bookmakers adjust odds to make the most of it. Therefore, you can perform the calculations at any time during the week preceding the game and then for example use your knowledge for trading in the hours before kick off. It really depends what type of betting you are most interested in. I may have solved the above problem. As I say I use oddsportal for ease of reference for checking odds and when following the course I may have overlooked the fact that HO/AO needs to be done using highest bookmaker odds. I think I got confused as I noticed the screenshot in 5.2 of the course for the bookmaker odds is the screen (or extremely similar) from oddsportal showing the average odds. I just took odds from that in my own testing…so this is where I amy have gone wrong. Would I be correct in saying highest bookmaker odds need to be used to get the HO/AO quotient? When I subsitituted the highest for average in my example above, everything aligned ok.
the Cluster Tables are using the highest bookmaker odds from the evening before the kick-off. In the course, however, I sometimes use average bookmaker odds for calculations especially if I like to make a point and show how close it is possible to predict the odds, or other points. Each screenshot/picture has a caption where I state if the screenshot is ‘highest’ or ‘average’ odds. I have a question about the betting table part of the spreadsheet that accompanies the course. Hope you can point me in the right direction. I have been following the process i.e looking for the match odds for a particular game, dividing average home odds by away odds to get the quotient, and then looking for that quotient in the home team chart and then the away team chart. Sometimes, not very often, I have noticed that when finding which quartile the quotient lies in, the corresponding odds range is such that the game odds for one team does not fall in that range. For example, if home odds were 1.23 and away odds 12.16, home/away gives a quotient of 0.1. It could then be, for arguments sake, that the corresponding game odds for that quartile (in the column to the right of the quotient values) shows as 1.31 – 1.39. I can’t figure out why the actual odds and the corresponding odds range doesn’t match. Does this actually matter when it comes to taking the percentage/odds values for the over/under goals? If so, does it relate to the time when I check the odds with somewhere like odds portal? I mainly look at the big Euro leagues i.e EPL, Bundesliga, La Liga and check the odds and do the analysis 5-7 days before the games take place. Not sure if using opening odds is ok, somewhere in between, or whether I need to wait right up until kick off for the most accuracy. I recently purchased the over/under goals course, which I have found very very useful. At present I am working through the course and have reached the section related to Bundesliga cluster tables – which I am trying to understand all the values related to the calculations. I can follow the formula but when I look in the data table for the values corresponding to “S” it shows me a blank column. Could you please tell me what value “s” corresponds to? Also I read in an article on the website that it is possible to obtain a password to unlock the data sheets. Could I have that please? Once again, great course. Love it so far and am really looking forward to continue with the learning. Even if it Excel help says that the result_range is optional, if you don’t put anything in, the formula doesn’t deliver the correct results. The way around this bug is, to have a result_range but leave it blank, without data. Regarding the passwords for unlocking the sheets, please look in the “Legal” tab. Hi, I bought the course last month. I got a question, how do you get the percentage of 27.84% for 0 goal in 2010-11? Page 18. Hi JC, it’s 5.4 (the absolute deviation for 0 goals in 2010-11) divided by 19.4 (average matches with 0 goals for the whole league). You’ve got the Excel spreadsheet which comes with the course. You’ll find most of the screenshots (and underlying formulas) there. This particular screenshot is from the “Goal Distribution” – tab, 4th table on the top to the right. Hi…I’ve bought the Fundamentals of Sports Betting Course….A question: what do you think… You see a team play fine… but the personnel in that team could change and they could also change the way they play every season.. What about this? For example, a fundamental change, like what happened to Manchester United a few years ago after Sir Alex Ferguson left. But even with big changes like this at single clubs, the synergy of the league doesn’t change much. (Unless the league format is altered from one season to the next). To be successful you have to play portfolios, rather than single teams. You will understand this all yourself once you have worked through the course. I’m stuck straight away, I’ve downloaded the data Bundesliga data from football-data.co.uk as explained on page 19. However the data doesn’t actually have total goals? It has home goals and away goals, so I have created a new column to add both to get total goals per game. However you offer no explanation on how to count total goals per game / per season? Counting goals is done via the COUNTIF formula in Excel. The cells “I9″ and I1538” refer to the Bundesliga cluster table, the ‘data’ tab. You will have to replace this cells with your own. Annoying that when copying formulas it changes the cell reference so I have to keep going into each individual formula cell and changing the reference cells range. Any easy/quick way round this? Like the old course the new edition contains cluster tables for calculating teams which have played in the league for the previous five seasons. In addition, we explain how to calculate games with teams who have played just two seasons in the league (at least 25 consecutive matches), but then H2H (6 games from the last 10 years) is required as correction factor. The cluster tables do not require H2H history, but I stress that the teams must have played in the last five seasons in the same league. With these two calculation methods you will be able to calculate approximately 80% of all games in a single league in a season. It’s only the newcomers to the league who do not fit the criteria. But to calculate matches for newcomers is very difficult and produces unreliable results. The course already extends 169 pages and if we would have tried to include how to calculate odds for newcomers, this would certainly have added another 50 pages. I want to know how the bookmakers calculate, if not, it’s of no value to me! You will learn how the bookmakers calculate, just not for the newcomers to a league. Does this book has a excel for fair odds calculate with no H2H ?